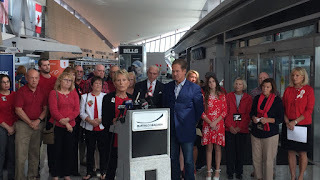 BUFFALO, N.Y. -- Congress members Brian Higgins (NY-26) Tom Reed (NY-23) and the families of Flight 3407 are calling for action to reauthorize the “One Level of Safety’ standards achieved in hard-fought legislation passed in 2010, following the crash of Continental Flight 3407. Since 2015, the FAA has operated under five short-term extensions of the Federal Aviation Administration's (FAA) legislative authority, the most recent being H.R. 1625, the Consolidated Appropriations Act, 2018, extending the FAA's funding and authority through September 30, 2018. Congress must either pass another extension or reauthorize the FAA by September 30th to avert a shutdown of agency operations. A compromise bill, H.R. 302, was released over the weekend. The House of Representatives is expected to vote on the bill as early as Wednesday, September 26, 2018 and then send it to the Senate for consideration before the deadline expires. After the Flight 3407 crash in Western New York on February 12, 2009, the National Transportation Safety Board identified serious safety deficiencies within the regional airline industry, including exhausting schedules, inexperienced pilots and insufficient training. Thanks to the persistence of the families of Flight 3407, in 2010 Congress approved the Airline Safety and Federal Aviation Administration Extension Act, which included greater transparency for travelers and additional rest time and training requirements for pilots. As a result of these new safety measures, there has been no fatal airline crashes in the United States for nearly a decade. Prior to the Flight 3407 tragedy, pilots with as few as 250 hours of flight time were being qualified to fly commercial airliners. The comprehensive legislation authorized in 2010 requires pilots and first officers to hold an Airline Transport Pilot certificate, typically attained through 1,500 hours of flight time training. Despite significant pressure from regional airlines and their lobbyists, the FAA reauthorization bill does not currently include any provisions to water down the 1500-hour pilot training requirement. Higgins, Reed and the Flight 3407 families are also calling for the FAA and U.S. Department of Transportation to fully implement the Pilot Training Database. The 2010 law called for the creation of a Pilot Record Database, providing airlines access to a pilot’s background, training history, certifications, incident summaries and employment record. The FAA released its beta test for its online Pilot Records Database in December of 2017, but have yet to move forward with full operation of the database.